How do I get the command line builds tools installed with current Xcode / Mac OS X v10.8 (Mountain Lion) or later? Unlike Xcode there is no installer (it's just a bundle). It looks like all the command line tools are there (in the bundle, under Contents/Developer), but none of the appropriate environment variables set to use them. Is there a script somewhere I can run that will setup my environment to support building from the command line? xcode-select --install worked with version 2333, failed with version 2003. So, try xcode-select --install and if that does not work download as described below. In early February 2014 xcode-select --install has been reporting that "Can't install the software because it is not currently available from the Software Update server". In late February 2014 the command started only displaying help. The solution is to download directly, see "Separate Download" below. 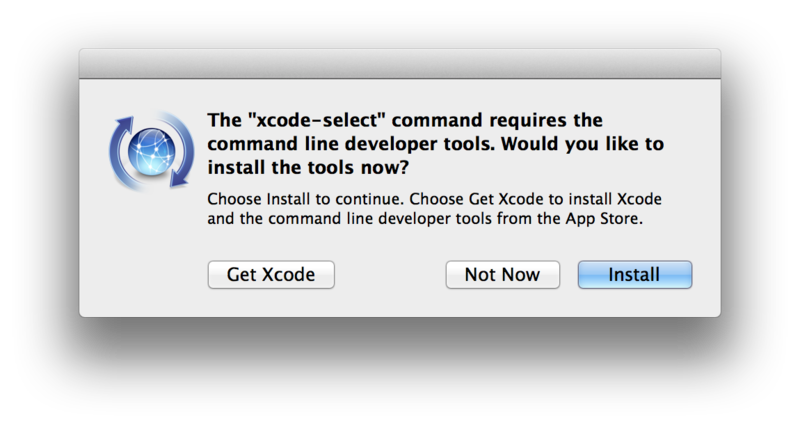 With Xcode 5.0.1 and Mavericks 10.9 the command line tool is no longer available through Xcode. Instead they must be downloaded from the Apple Developer Tools site: https://developer.apple.com/downloads/index.action. This requires signing in with a developer account. Or via terminal (from the release docs): The Command Line Developer Tools package can be installed on demand using "xcode-select --install” and the installed tools will be automatically updated using Software Update. OS X 10.9 is required for this feature. For earlier versions, continue to use the in-app download in Xcode. Xcode includes a new "Downloads" preference pane to install optional components such as command line tools, and previous iOS Simulators. To open this pane click the "Xcode" button in the top left of the screen near the Apple logo, then click "Preferences", then click "Downloads". Go to developer.apple.com/downloads/index.action, and sign in with your Apple ID (the download's free). In the pane on the left, search for "command line tools" and choose the package appropriate to your version of OS X. Requires Mac OS X 10.7.3 or later. If you take a look into "Console" while trying to pull the Command Line Tools, you will find out that there is actually an "unofficial" link to the Mountain Lion Command Line Tools! and 403: Forbidden unless logged in with a qualifying developer account. Free accounts have access to everything except prerelease software and full OS installs. In particular, the command-line tools packages that coincide with the release of Xcode 4.4 (the "July 2012" packages) were posted on July 27, for both Lion and Mountain Lion. Unlike log files, deep-linking Web pages, and the Xcode Preferences window, this page also links to lots of other useful downloads for free and paid developers alike, including everything else that has been unbundled from Xcode (audio tools, accessibility tools, etc. ), OS X kernel debug builds, and release versions of Xcode back to 1.0. It doesn't even require XCode if all you are after is the command line tools. note that from within Terminal you can use the XCRUN tool to launch compilers and other tools embedded within the Xcode application. Use the XCODE-SELECT tool to define which version of Xcode is active. Type "man xcrun" from within Terminal to find out more. Once you've latest command line tool installed in your system, set it from Xcode Menu. I recently had to install Xcode command line tools on Mountain Lion over SSH. Notice: I imagine this process would work identically for any version of Xcode or OSX. Just make sure you get your paths correct. For me, that was "Command Line Tools (OS X Mountain Lion) for Xcode - April 2014"
I see no purpose keeping it around, but you can if you want. 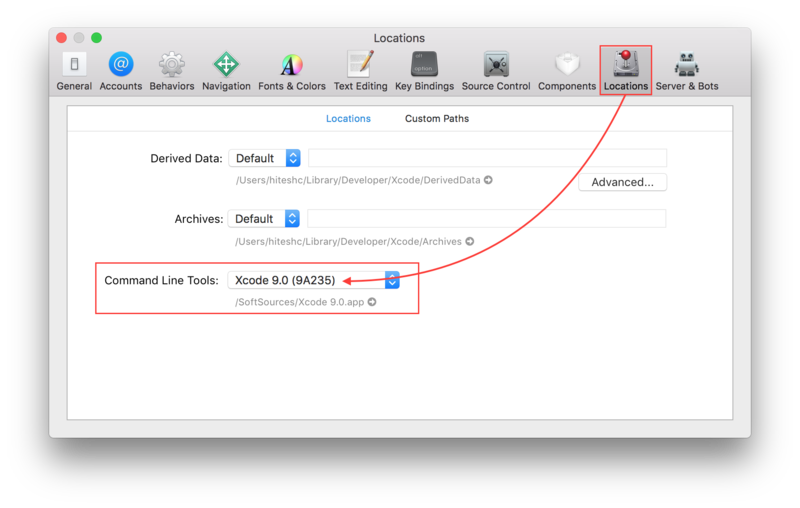 UPDATED: On Lion 10.7.4 the Command Line Tools are already available from withing XCode. You can get it freely from App Store. You can automate the installation of Command-Line Tools in bash. I needed to do this when I was automating the developer onboarding setup process. try going into Xcode > Preferences... > Downloads and clicking the button with a downward arrow in a circle next to command line tools. How do I get the command line builds tools installed with Xcode 4.4 / Mac OS X v10.8 (Mountain Lion) or later? Downloading command-line tools is not available in Xcode for OS X 10.9. How can I install them on my machine? Not the answer you're looking for? Browse other questions tagged xcode macos download command-line-tool or ask your own question. Why is apt-get function not working in terminal on mac osx 10.9? command line tools for new 10.9 OSX for ruby gems?